The website has been reworked (from the ground up) to be compliant with the newest web standards (HTML5) and to be able to support people looking at our website on mobile phones. In the future this will mean that we can host more video than in the past. 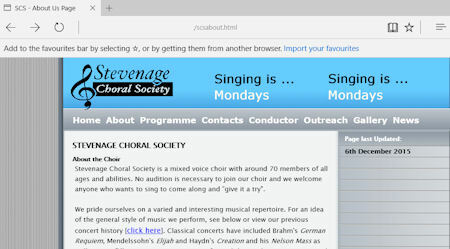 When you connect to our home page http://www.stevenagechoral.org.uk/ from a mobile phone the web page code will detect the smaller screen of the phone/tablet and divert the page to a narrower and smaller version of the page contents. This page content should be zoomable on the phone so you can resize the text to fit your phone screen width. This switch will ONLY happen if the phone has a low resolution display...something like an iPad with a high resolution screen will display the page contents as before. The image above was captured on a PC, the mobile version would normally be only the width of the banner. As a page author I can add markers into the page that guide which parts of the page content can be rendered in Reader mode. What's the advantage? Reader mode gives you the text and images alone without background graphics - and you can resize the text. Picture=1000 words ....see below. How do I know if a page supports Reader mode?. 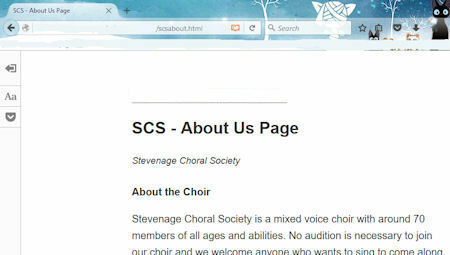 Short answer is that there is a graphic that appears in the internet address bar, see the example below for the scs "About Us" page. You can see the graphic looks like a book... on pages that don't support the feature this little graphic doesn't appear. Below is the "about" page as it normally looks (scaled down to fit page width). You can see the graphic has changed colour to orange (in this browser) and the text is rendered in a bigger font. 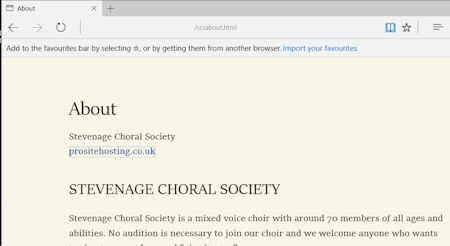 In this example (the Firefox web browser) has a font setting "Aa" tab which, if you open it by clicking, displays a menu that can change the font size and type and colour. Click on the back facing arrow (top left of the web page as shown), the browser drops back to normal mode. Are there differences between the Firefox and Edge implmentations of Reader mode?. Sadly, yes there are. Here's the graphic in the URL bar when a page supports reader mode. The graphic is animated in the Edge browser showing pages turning over. 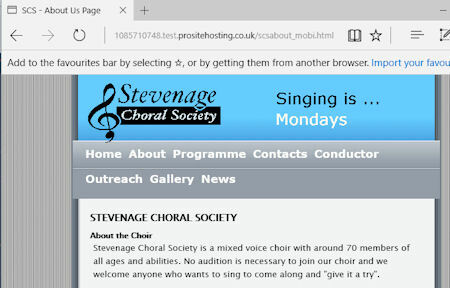 Unfortunately the reading experience isn't quite as good with Edge. It is possible to change some reading settings (darkness and font size but not font type) using the settings menu of the browser but it's not as flexible as the Firefox implementation (which is on-screen in front of you). Any other changes because of the new site? Only really one for the normal user.... On the old version of the site you had to right click to open new windows in another pane.... Now a simple click on the link will load the new page into the browser. For the techie ... the site is now all HTML5 throughout and can be verified as error free by clicking on either the 5 graphic on some pages or by clicking on the HTML5 link at the bottom of the page... Hopefully all the pages SHOULD come back error free ... if not then let me know......Happy Surfing! ... Your friendly webmaster.